Jaguar Land Rover recently announced plans to set up the company’s new regional headquarters in Dubai Silicon Oasis. Can you tell more about the company’s plans for this region and the importance of the Middle East market for JLR? The MENA region is one of the largest markets for Jaguar Land Rover in terms of sales and we expect the market to continue to play a significant role in our business growth. Our decision to establish the company’s regional headquarters in Dubai Silicon Oasis is part of our commitment for the region. The project is set to comprise of a training academy, an engineering testing centre, a customer relations centre and it is scheduled for handover in the year 2020. Every luxury car manufacturer company is now launching SUVs. Bentley has Bantayga and even Ferrari and Lotus have announced plans for SUVs. Will this affect the market for your models? The SUV segment is one of the fastest growing vehicles segment and the demand is constantly rising. Of course, we always have one eye on the competition, particularly the growing number of sporty, compact SUVs. But we are confident that our cars offer a unique mix of performance and practicality, which no other competitor can match. 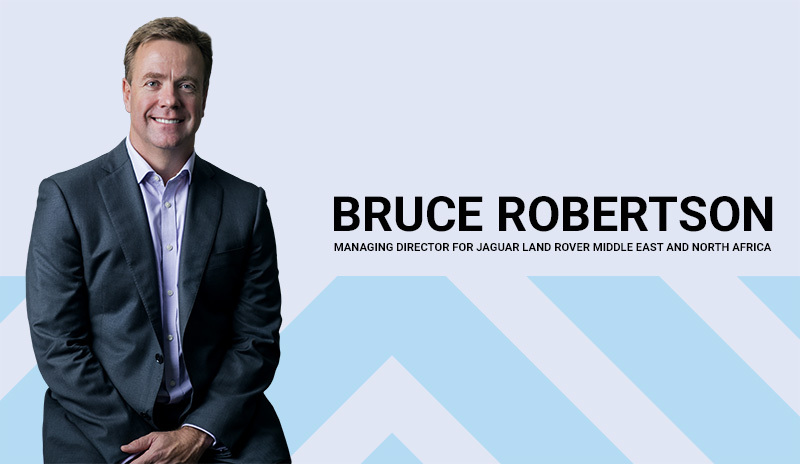 Jaguar Land Rover has staged a remarkable recovery on the financial front from the time it was driven to seek help from the government after the recession. Can you give us an idea of the company’s performance in the 2017 financial year and the plans for the year ahead? Despite tougher conditions in key markets, we are proud to say that on a global scale, 2017 was the best ever full-year in terms of sales, with 621,109 vehicles sold and 7% up year-on-year for Jaguar Land Rover. Jaguar did extremely well and sold a record-breaking number of vehicles globally, up 20% year-on-year. Overall, our sales have more than tripled since 2009, driven by an award-winning product portfolio. For 2018 we continue to focus on delivering sustainable and profitable growth. We remain cautiously optimistic on achieving great results driven by new models. The automotive industry in this region has been experiencing a slowdown and is slowly bouncing back. How has this affected Jaguar Land Rover? Has this changed your retail and marketing strategy? The automotive sector in the region is becoming increasingly competitive. We are happy to see the start of a journey towards a more mature market in terms of trading both new and used vehicles. In 2017 we launched our first dedicated Jaguar Land Rover APPROVED used-car facility in Dubai, with our local retailer partner, Al Tayer Motors. Last year we also lunched the new Jaguar Land Rover ‘ARCH’ corporate identity across MENA dealer network meant to deliver a premium experience every step of the journey for our customers. Customers’ service is a great focus area for us. Selling cars is one thing, providing premium customer service is another. The Range Rover Velar won the World Design Car of the Year Award. Can you tell us more about this model and the other models that were launched in 2017 like the Jaguar E-Pace? The Range Rover Velar is an outstanding, superior SUV. Compelling modernity, eye-catching design, innovative Touch Pro Duo infotainment technology and a clear focus on sustainability. I believe this product speaks for itself. It is definitely the most beautifully designed vehicle on the planet and winning the World Car Design of the Year title at the 2018 World Car Awards is well deserved. 2017 has been a great year for us in terms of new products lines. We launched some very exciting new models such as the Ranger Rover Velar, the Jaguar E-PACE, the new Jaguar XF Sportbrake and the XJR575. For the Middle East, the new Land Rover Discovery was one of the most anticipated cars in our region and it received great interest from the public. Which are the most popular models in the Middle East market and why? Range Rover and Range Rover Sport, Range Rover Evoque, Jaguar F-PACE and the Jaguar XJ are among the most popular models in the region. In 2017 we introduced the Jaguar E-PACE which has been received with great enthusiasm, while the newly launched Discovery and the Range Rover Velar are making their way up to the top of our customer’s preferences. We anticipate strong sales for all three models. Norms regarding emissions and fuel efficiency are becoming more stringent across the globe. Jaguar and Land Rover are brands that are known for performance and luxury models. What technological innovations have been developed to confirm to the new norms? Jaguar Land Rover has made significant investments in new technology and environmental innovation and we are committed to complying with all global emissions regulation. From 2020 every new Jaguar Land Rover vehicle will have the option of electrification and we continue to invest heavily in ultra-clean petrol and diesel engines. With every new model year vehicle we continually and progressively make technological improvements that further reduce emissions. Jaguar Land Rover is now producing some of the cleanest diesel engines in the world with pollutant emissions equivalent to those of petrol engines. In the past decade Jaguar Land Rover has reduced CO2 by 25%, NOX by 84% and particulates by 95%. We will continue our efforts to improve emissions and fuel economy by increased use of light weighting technologies, vehicle energy conservation and engine downsizing. Dubai is moving fast when it comes to promoting the use of electric cars, with several incentives like free Salik and parking for those who buy electric cars. How soon can we expect to see electrified JLR models in the Middle East? We salute the support of the Municipality for electric vehicles, this is in line with our plans for the future. From 2020 all new Jaguar Land Rover vehicles will be electrified. We will introduce a portfolio of electrified products across all models range, embracing fully electric, plug-in hybrid and mild hybrid vehicles. Our first fully electric performance SUV, the Jaguar I-PACE is expected to arrive in the Middle East within the coming two years. The MENA region is renowned for its early adopters, and as such it is key we keep up pace with the needs, expectations and requirements of our discerning customers. This is an era that has been marked by the accelerated pace at which new concepts and technologies like shared mobility, autonomous vehicles and electric vehicles are being adopted in the automotive industry. How is JLR coping with these changes and how has this affected your plans for models in the years ahead? Technical innovation, including autonomous, connected and electric technologies have always been at the heart of our business. Autonomous is a key strand of the future of mobility, as well as connected, electric and shared premium mobility. We are involved in a number of autonomous research projects including UK Autodrive consortium and our venture capital arm, InMotion Ventures recently announced a significant investment in Voyage, US based self-driving taxi startup. Our collaboration with Waymo (formerly Google self-driving car project) is another exciting long-term strategic partnership which has been announced recently. Together, we will develop the world’s first premium self-driving electric vehicle for Waymo’s driverless transportation service. Over the past five years, we have invested more than £15 billion in research and development. This year we will spend more than £4 billion on new product creation and capital expenditure. No rival spends as much as we do on R&D, as a percentage of revenue. It’s a responsible approach to ensuring our business grows in the future. In this era of connected cars, customers expect a lot when it comes to in-car technology. What new features do JLR’s new models offer with regard to this aspect? Our world is going to change more in the next decade than it has in the last century. The car will no longer simply take you from A to B, but create a truly personalized experience space that gives you the luxury of time – work or leisure. Our connected car technology connects our customers to the road and to other cars and it delivers the right information at the right time to make sure customers reach their destination as quickly and as safely as possible. Our connected technology enables customers to have their own virtual bodyguard looking out for their safety and that of their family as well as everyone and everything around them. Inside the car, your digital butler will tailor your environment to your personal preferences including the right temperature, the quickest route to your next destination, advise if your flight is delayed and recommend the best playlist for your journey. Today’s connected car technologies are shaping our future self-driving cars – ensuring that the vehicles respond instinctively. In what way has Jaguar Land Rover changed as a company after becoming part of the Tata Group? In 2018 we are celebrating 10 years of Tata ownership and I proud to say that Jaguar Land Rover is a strong and vibrant company, well-positioned strategically and financially for sustainable, profitable growth. In the past five years sales have increased by almost 50%, our workforce has grown by 16,000 people and turnover has increased by almost £9 billion. Jaguar Land Rover currently employs more than 43,000 people globally. There has been a lot of emphasis on safety in recent years with companies like Ford, Toyota and Honda offering advanced safety features as standard on their mass market models. How do JLR models rate when it comes to safety and what new technologies have been developed in this regard? Vehicles from Jaguar Land Rover feature some of the most advanced safety and security technologies available today. Form the “soft landing” technology, which detects the size and weight of the front seat passengers and adjusts airbag contact accordingly, to the anti-whiplash systems, which move the head restraints forward to support the neck in the event of a collision, we are pioneers in active safety features. To ensure maximum security, vehicles from Jaguar Land Rover are constantly protected by an alarm and engine immobiliser. The InControl Secure system, for example, can detect any illegal movement of your vehicle and liaise with the authorities to pinpoint its exact location.